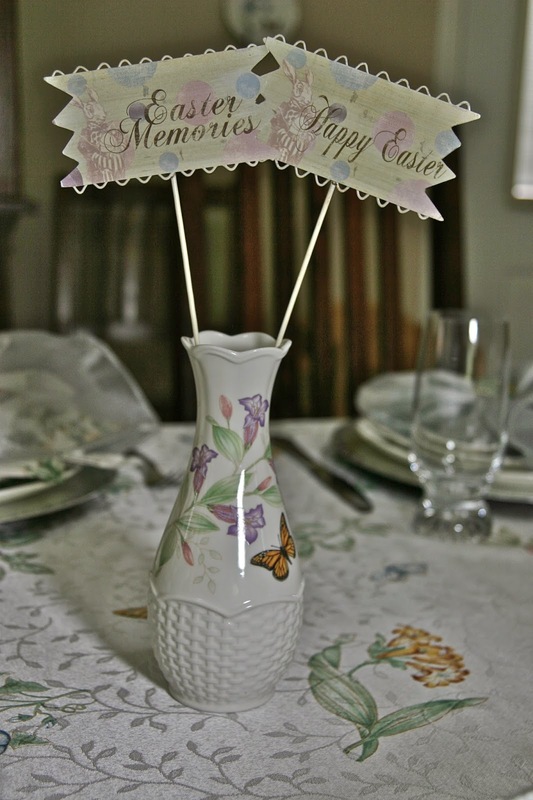 After Easter last year, a local department store was having a sale on the Lenox pattern, Butterfly Meadow. I had always oohed and ahhed at these dishes. They have scalloped edges and their white porcelain finish is accented with four different garden patterns of delicate sprigs of flowers, ladybugs, bumblebees and of course, colorful butterflies. There are numerous accent pieces, as well: platters, cream and sugar sets, salt and pepper shakers, vases, mugs, bread and butter plates (highlighted with spring pastel-colored borders), bowls and teapots. I could never pass the display in the store without stopping by to admire the sets. Few tablescapers could resist the call of these lovely dishes! My Hubby saw me stop in my tracks as I gazed at the sale prices last year. He was very impressed with the price on the boxed sets (4 place settings which included dinner and salad plates and mugs). Before I knew it, three boxed sets made their way to the check-out line, and my table for this year's Easter Dinner was set!! ( Sorry, ladies, this generous man is taken!!). Over this year I added accent pieces, as well as a tablecloth and napkins and napkin rings. I have been eagerly anticipating Easter Dinner this year because not everyone knew they'd be greeted by a new set of Lenox plates. The pictures that follow show how my Easter table turned out. I don't generally like a "matchy-matchy" table, but I was happy with the outcome of this one. For my first layer of the dish stack I decided to use my silver chargers from Michael's. I decided I wanted a formal look this year to highlight my new dinnerware. The next layer of the dish stack is the dinner plate. There are 4 different patterns to the set. I LOVE each one. Next comes the salad plate. Again, each plate reflects a different view of the garden. I especially adore the tiny ladybugs that find their way onto each plate! Can you see the one crawling on the green leaf? I used a silver napkin sheath to surround the napkins that match the tablecloth and added the butterfly napkin rings that are designed to coordinate with the tablecloth and plates. There are turquoise, pink, yellow and green enameled napkin rings. And they finish my dish stack. I completed each place setting with my Mikasa Regent Bead flatware and Mikasa water glasses. I kept my centerpiece small because everyone in the family contributed a side dish and I knew there would be a full dinner table, so I needed the room for serving pieces! It consisted of an Easter Bunny I found at HomeGoods many years ago, nestled in some Easter grass and sitting atop an Easter plate found on a trip to Northern CA at a favorite gift shop we always stop at while traveling up north. I had room for a special pair of candlesticks that were a wedding gift from a precious friend. My Fitz and Floyd salt and pepper shakers join us every Easter! This bud vase was a Christmas gift from my daughter and son-in-law who knew I had gotten new Lenox dinnerware. These salt and pepper shakers are a part of the Butterfly Meadow collection. These are additional accent pieces from the Butterfly Meadow collection. These are the salad plates with their various patterns. These are the various dinner plate patterns in the set. All in all, it was a wonderful Easter this year. I hope all of you had a blessed Easter surrounded by family and friends! I'll be linking up to www.betweennapsontheporch.net for Susan's Tablescape Thursday. Thank you, Susan, for hosting!! I love to read your comments. They are always an encouragement and appreciated. If you'd like to follow my blog, please go to the top where it says, "Follow by Email". Put in your email address and hit "Submit"! Wow how wonderful you got those dishes and at such a great price! Lenox makes beautiful china. Your table is beautiful- love the tablecloth and all the accents. We used the kitchen table for the food and served buffet style, otherwise I couldn't have left my centerpiece in place. I hope your Easter was great! How I love your table. Your treasures are so unusual (at least for me). Nothing as such I seen in Sweden before. Gorgeous and thank you for sharing. Just beautiful. Love those dishes and your centerpiece was smart and adorable. Your family must have felt very special. what a beautiful table Rosie, and how sweet of your husband! everything looks beautiful together, and I can see you using these in so many different ways. Nice all your family was able to be together for Easter. I love the Lenox Butterfly Meadow pattern. It is totally Spring! Perfect for an Easter table setting. Simply beautiful. I am torn about centerpieces. Last year I had a vase of flowers and a couple of bunnies. This year I had centerpiece overload. I did remove half of the bunnies from the centerpiece and almost everything else except the place settings before we sat down to eat. Lovely...you have used this pretty china so well. You can never go wrong with Butterfly Meadow! I can't believe how well those butterfly plates match the table cloth! It is all so seamless! I have seen a lot of butterfly things lately, and your table is one of my favorites! Love your kids table too!